Showa Holdings Co., Ltd. (TOKYO:5103) currently manages six major businesses and rubber business is our first business since the company’s establishment that now aims for business expansion throughout Asia in the scheme of our mid-term management plan. 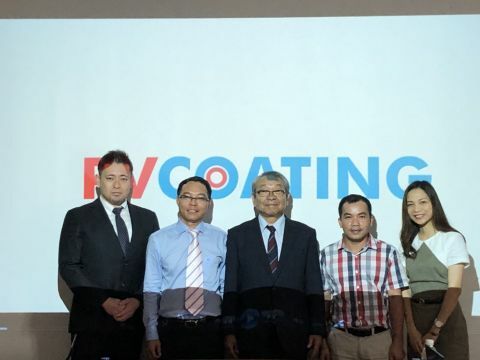 In November 2017, Showa Brain Navi Vietnam Co., Ltd (SBNV), our subsidiary engaging in rubber and entertainment contents business concluded a memorandum of understanding (MOU) on collaboration in the provision of rubber lining business in Vietnam with PetroVietnam Coating Joint Stock Company (PVC). This time, we would like to announce that the official signing ceremony took place at PVC office in Dong Nai province on 22 January 2018. PVC is the first company in Vietnam specialized in pipe coating under Vietnamese state-owned oil and gas giant PETROVIETNAM. Since the beginning of its operation in 2010, PVC has been a leader of improving coating technology by adopting latest facilities and has accomplished many works. PVC is also recognized as the most innovative company in Vietnam. Based on the MOU, we will perform cooperative relationship with PVC including joint sales, operation support and material supply to expand our business in Vietnam. This business cooperation also enables PVC to tap into our technology and application knowledge of Rubber lining. We strongly hope to establish close, long-term and win-win partnership with PVC. We as a group established our local office in Vietnam in August 2015 and have strived to expand rubber lining business in Vietnam since then. This MOU execution is one of our accomplishments and a big step for our further development. The signing ceremony took place in the presence of Mr. Le Hong Hai, Vice President of PVC and Mr. Pham Hoang Sang, Director of Commercial division and Mr. Huynh Kim Dao, Deputy Director of Economic Technical division and Ms. Miharu Tsuchiya, Managing Director of SBNV and Mr. Tamotsu Somiya, Managing Director of Showa Rubber (Thailand) Co., Ltd. and Mr. Tadashi Watanabe, Senior Executive Director of Showa Holdings Co., Ltd and Chairman of Showa Rubber Co., Ltd. and Mr. Tatsuya Konoshita, Representative Officer and CEO of Showa Holdings Co., Ltd.
We aim for further developments in both rubber business and entertainment contents business in Vietnam. We sincerely ask for continuous supports and hope you look forward to future business expansions in Vietnam. We have 6 offices for rubber business in Asia including Vietnam. Vietnam: Showa Brain Navi Vietnam Co.,Ltd. Thailand: Showa Rubber (Thailand) Co.,Ltd.